John McCain almost scored a Shamnesty Trifecta this weekend. Senator Mel “Amnesty” Martinez the former RNC Chair endorsed John McCain on Friday. 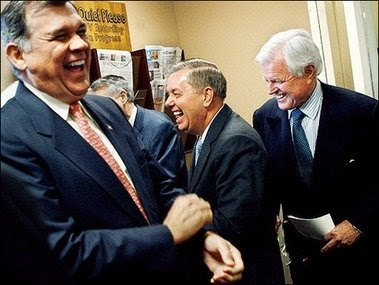 Senator Lindsey “We’re going to tell the bigots to shut up” Graham had endorsed him earlier. From the Ted Kennedy website– Senator Teddy Kennedy pushes the extremely unpopular immigration/amnesty plan with supporters Senators McCain and Graham listening in the background. Senator McCain also scored the backing of Geraldo Rivera and added Open Border advocate Juan Hernandez to his team this past while… Probably because they know where he really stands on securing the border. But sadly… shamnesty Senator Teddy Kennedy will back Barack Obama. Teddy knows where his home is- even after a long night out.